Two more cities have been added to our monthly User Groups - Melbourne and Brisbane. Developers will meet to exchange ideas and listen to presentations by local and international industry experts. SSW China was established in 2004, in Beijing. We now have a second office in Hangzhou. In the past ten years, SSW China has served hundreds of domestic large and medium-sized enterprises such as Huawei, Jingdong and Agricultural Bank of China. At the end of SSW TV's first year, we had 50,000 views. In our fifth year, we're at more than 20 times that. Read Adam's post about this. SSW opened its newest office in funky Hardware Lane in the Melbourne CBD. Come visit our office. Microsoft has recognized our innovative and holistic approach to training, and seen the value of the fantastic course outcomes, even though the numbers are substantially smaller than the large learning institutions. SSW expanded to Europe - Slovenia and Belgium. We now have offices delivering custom solutions in 5 different continents. In January we had the first ever FireBootCamp, SSW's 9-week intensive course focused on software development methodologies based on building modern web applications with ASP.NET MVC. Adam unveiled the new SSW logo believing the modern look will carry us further into the future. SSW's latest project, the new site at www.eventcinemas.com.au went live to the public this year, showcasing SSW's design and development skills superbly. The wildly popular Sydney .NET User Group expanded its reach exponentially by live streaming every month, allowing attendees from all over the world. SSW becomes the 1st tech company in Australia to have our own video channel at tv.ssw.com and we also offer video services to our clients. SSW is the first company to go live with a TFS 2010 system in production, and delivers world standard Scrum training. SSW further focuses its development methodologies and completes a transition from Agile to Scrum. SSW is awarded as one of only a handful of Certified Scrum Training companies worldwide endorsed by Ken Schwaber. SSW has more Scrum Certified Trainers than any other company in Australia. Mark Hetherington joins the team as a productivity and workflow consultant. SSW opens its UK office headed by Microsoft ALM MVP Martin Hinshelwood. SharePoint 2007 is one of the fastest growing technology offerings in Microsoft's history. 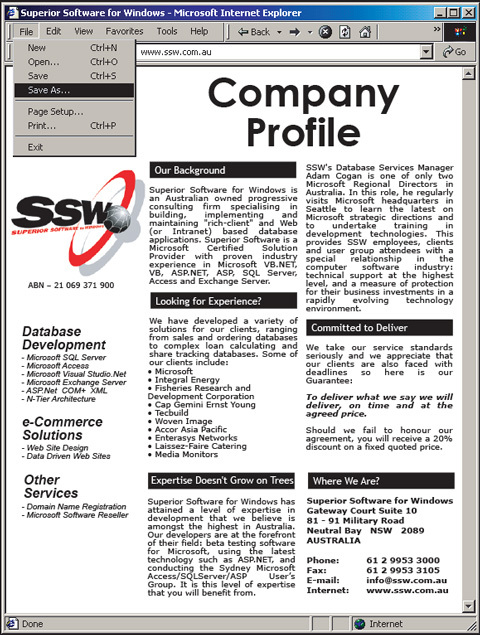 SSW is a recognized leader in SharePoint development and builds the biggest SharePoint site in Australia. SSW also designs, develops and deploys the Microsoft SharePoint.com site. By embracing Agile software development approaches, SSW streamlines its offerings to clients and is recognized as a leader in rapid application development for businesses and companies. Technologies such as jQuery become popular and re-invigorate the web space. SSW opens its China office. SSW develops key skills in Microsoft Dynamics CRM. SSW opens its Brazil office. SSW's focus extends to Microsoft SharePoint and delivers solutions including mid-sized business portals. SSW provides migration services, consulting, and products to help companies migrate from VB6 and Access to .NET. SSW replaced an existing DOS system, to automate quote calculation and to integrate with Microsoft Great Plains Accounting for invoicing. In conjunction with SQL Server, the new system could generate reports powered by Crystal Reports whislt being exportable to Acrobat PDF. Microsoft releases .NET 1.0? SSW is an early adopter. Adam Cogan (SSW) and Charles Sterling (Microsoft) do the keynote and launch the .NET runtime to Aussie developers. SSW renames User Group to be the 'Sydney .NET User Group'. SSW delivers numerous Windows client solutions using VB6 and Access. SSW works with beta version of .NET Framework 1.0 and releases the very first ASP.NET web application in Australia (running on the beta). User Group presents on Web Services for the first time in Australia. Figure: SSW celebrates IE5 with a new brochure for TechEd hold in Cairns. SSW's Chief Software Architect - Adam Cogan - awarded as a Microsoft Regional Director. SSW recognized as a Microsoft Gold Partner. The Rules have since grown to more than 3,000 separate rules covering Microsoft technologies and software development methodologies. SSW Upsizing PRO! becomes the leading 3rd party tool for Access. Sydney Access User Group renamed to 'Sydney Access/VB/ASP/SQL Server User Group'. SSW builds extensive experience in web development and becomes one of Sydney's leading ASP development companies. SSW embraces developing applications in Visual Basic. SSW starts getting serious with SQL Server 6.0 giving enterprise-level back-ends to their Access and VB apps. Customers start referring to us regularly as SSW. It sticks. The company focuses on Microsoft Access solutions and is one of the premier Access development companies in Australia. Clients start sending cheques made out to SSW instead of Superior Software for Windows. Banks honour the cheques! The company launches the 'Sydney Access User Group'. 1990 - Superior Software for Windows - is born! The company mission is to provide excellence in software development, targeting the Microsoft Windows 3.0 platform.